Oak Street Health is now working with Aetna in Chicago for Medicare Advantage members in an arrangement that looks similar to Iora’s partnership with Humana. This type of primary care intensive model seems to work really well with the MA population, particularly since 1. member retention is really high, meaning that potential downstream cost savings in years 3–5 can be captured, 2. the revenue that an insurer gets per member is high enough to cover off on the increased primary care costs, 3. risk adjustment is huge and Oak Street should theoretically do well at that. Access to 26,000 new potential members is great for Oak Street. Link. This was an interesting read on research suggesting that Instagram posts can indicate whether or not someone is depressed. Link. Although I can’t help but think about Madison Holleran and the ESPN story on her death a while back when reading this and wonder about how useful this is outside the study setting. It’d be great if this kind of research can help prevent future stories like hers. Here’s a link to the ESPN article. Remedy Labs, a startup that was attempting to help individuals navigate understanding and negotiating their medical bills, has shut down. The financial impact is there and I like the concept, but I imagine the revenue model / cost of acquisition of customers was hard to figure out. Link. IBM’s Watson coming under more scrutiny publicly. The emperor has no clothes feels like an appropriate thing to say here. Link. On a related note, I’ve always found Noam Chomsky’s take on the current state of AI fascinating (most current forms of AI can be practically valuable, but are just advanced forms of search; true AI will be developed by understanding how the brain works). Link. Was laughing at this quote on managing physicans: “Managing physicians is like being on the Atkins diet. You don’t actually live longer, it just feels longer”. It’s an interesting discussion topic, though. Link. Oscar continues building their own EMR internally and sharing where they’re at. I wonder how this will be used with their new Cleveland Clinic partnership / what usage stats are for their network. Link. A price transparency tool is created and not used. 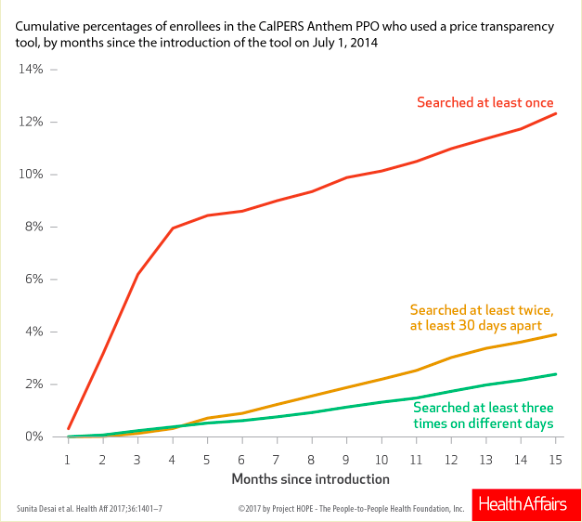 “Simply offering a price transparency tool is not sufficient to meaningfully decrease health care prices or spending.” Hm. Would be way more interested in knowing how this tool was designed to fit into the way a person evaluates their options for healthcare. Anyways, the usage stats are interesting in the chart below. Link. A new Hepatitis C drug from Abbott is being sold for only $13,500 per month, versus the $31,500 per month for Harvoni and is causing a stir. 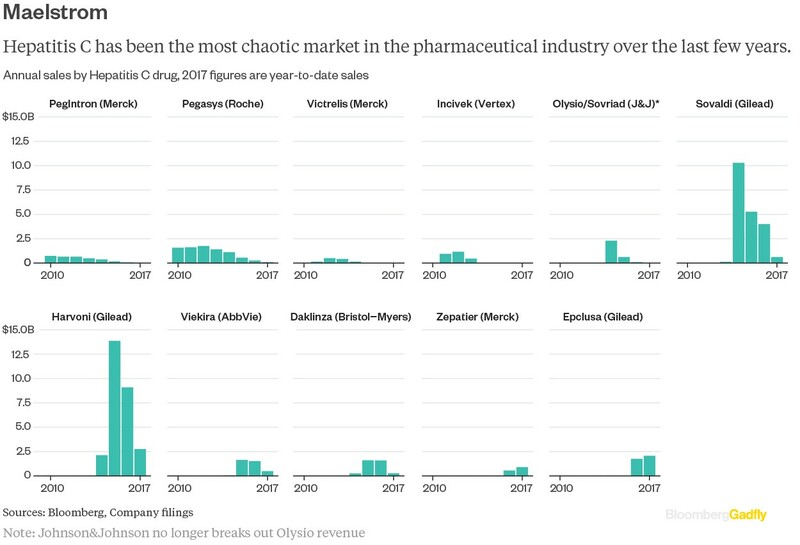 Hep C drug prices are insane — particularly the Sovaldi and Harvoni sales charts from the article below. $10 billion jumps in sales in one year? Woah. Link. Harvoni and Sovaldi sales confuse me. That is a lot of money. Data suggesting that pharmaceutical payments to physicians do not influence the prescription of prostate cancer drugs. Goes in the face of what seems to be the prevailing thought here, but interesting to look at. Link. Using Social Determinants of Health data can help payment formulas better account for particularly vulnerable populations, as this study of Medicaid beneficiaries in Massachusetts demonstrates. Link.